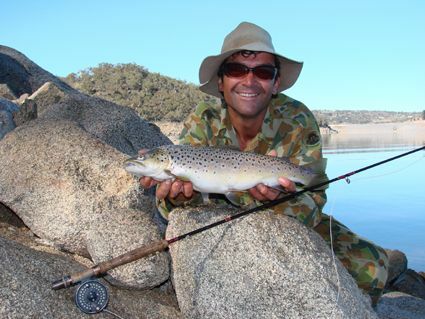 Rivers:- Some great dry fly reports over the last week with the Thredbo being the standout. The Moonbah has had some nice fishing and reasonable fish too. *Phil and Chris Lesek had a good evening session at Collingwood Bay with Chris caught a great 1.5kg Brown and 2 Rainbows, Phil caught two Rainbows. All were on Mudeye patterns. 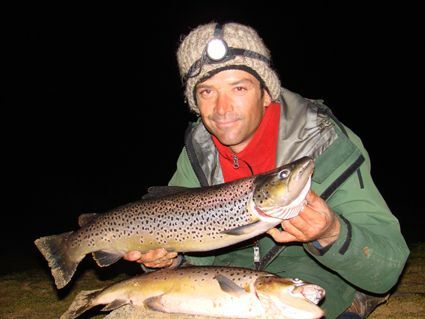 *Neil Huolohan from Orangeville fished the Braemar Bay area for twelve fish in the 35cm range. Daytime with a brown nymph worked well and the evenings a Spider Mudeye and Craig Nightimes were the best flies at night. He also reported losing a couple of bigger fish in the weed. 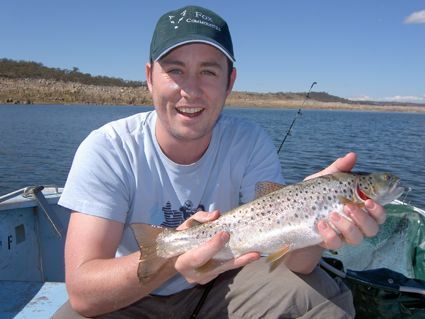 Pics of fish from Lake Jindabyne taken during week. Jindy fished well late, the Browns taken in good nick and on yabbies. Polaroided a few during a morning session, not as good as it should in a couple of months, but fun if you are prepared to look. *Marty Bajt from Canberra fished from the boat in the Brookwood bay area and threw a few Scorpion 35's around. He finished up landing fourteen Rainbows and 2 Browns on the Rainbow Trout pattern. Fish were all around the 40cm length bracket and were little foot balls in shape. He also found an old illegal gill net which was entangled in a fence. Fisheries were notified and have removed as much of the net as possible and will continue to do so as more of the fence shows with the receding water. If anyone finds what they think could be illegal nets in any of our Trout waterways, don't attempt to remove destroy them. Contact local fisheries officers to investigate. It is better to have a way to catch the poachers returning to check the net and also saves running the risk of Fisheries catching you in possesion of an illegal fishing implement. * Above a nice Brown taken in the Buckenderra area. 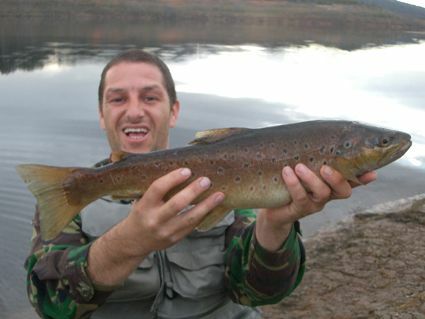 See Matt and Brett's report in the Baitfishing section for their other captures. *Thought I'd send a few snaps from my mate Brett and I on our recent trip to Buckenderra. Fishing was generally good, with the two of us landing 14 over three days. 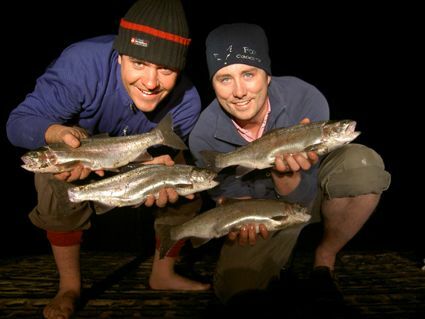 12 Rainbows and 2 Browns, all 37-45cm and in great condition. Fish were all probably 750g - 1.25kg, and some gave us a real run for our money. Over the three days we took three on the troll, five on mudeyes and six on powerbait. Trick was to be patient as all fish were caught in runs of 20 minutes or so, there would be nothing doing for hours at a time then all of a sudden everyone fishing within 200m either side of us would be catching them at the same time, bizarre. Attached are several photo's.